The Nisk property is composed of one block totaling 112 claims covering an area of 5,763.42 hectares and a length of over 20 kilometres. The Route du Nord from Chibougamau runs inside the south border of the property. The property is also traversed in a NE direction by a Hydro-Québec power line and a road that heads north to the Eastmain River and beyond to the La Grande River area. The Lac des Montagnes volcano-sedimentary formation crosses the property in a NE direction. The geology covered by the property is mainly composed of biotite, sillimanite, staurotide and garnet-bearing gneisses and granites, pegmatites, amphibolites and ultramafic intrusive rocks. Geophysical surveys show the signature and extent of ultramafic intrusions, some of which have been historically confirmed by drilling. The North of the Lac des Montagnes formation is mainly composed by orthogneisses intruded by granites, while the South area of this formation is composed principally of paragneisses, also intruded by granites. The property is currently known for its magmatic nickel-copper sulphide deposits associated with ultramafic intrusion potential. It notably holds the Nisk-1 Ni-Cu-PGE deposit. The Nisk-1 deposit is located at UTM coordinates 459,950 mE / 5,728,500 mN. It is hosted in an elongated body of serpentinized ultramafic rocks that intrude the Lac des Montagnes paragneiss and amphibolite sequence. The ultramafic rock intrusion is a sill bordered by paragneisses and amphibolites. Quite similar on either side of the ultramafic sill, they still can be subdivided into a lower paragneiss sequence ("LPS") to the NW of the sill (stratigraphically older) and an upper paragneiss sequence ("UPS") to the SE of the sill (stratigraphically younger). The ultramafic sill is not a single intrusion. At least two distinct lithological units can be identified. The first, a grey serpentinized peridotite with magnetite veinlets, does not contain any sulphide minerals. The second is a black serpentinized peridotite with chrysotile veinlets. The Ni-Cu-Co-Fe sulphide mineralization is invariably associated with this black serpentinite. In summary and on average, the sequence intersected by drilling, (striking N164°E with a 50° to 70° plunge to the SE) in the ultramafic body is as follows: (i) 35 meters of unmineralized grey serpentinite; (ii) 4 meters of unmineralized black serpentinite; (iii) 12 meters of massive to disseminated sulphides in black serpentinite; and (iv) 27 meters of unmineralized black serpentinite, sometimes alternating with the grey serpentinite, also unmineralized. 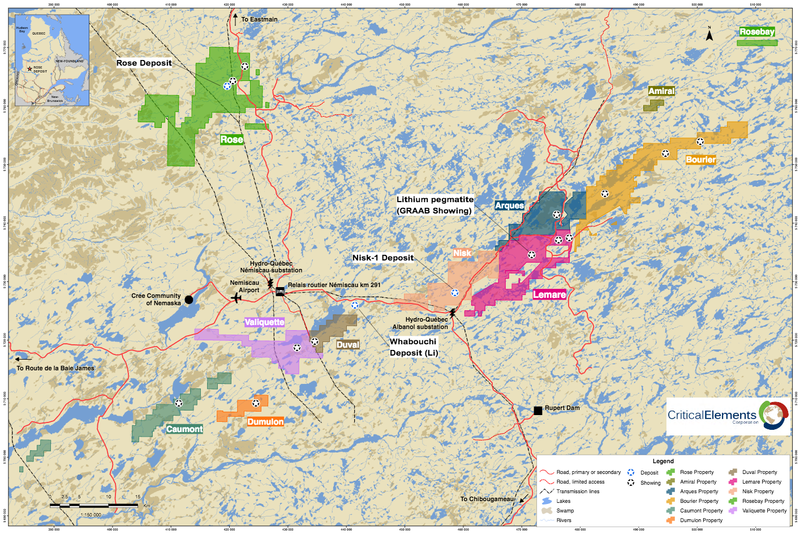 The Nisk-1 deposit is the only mineralized zone with estimated resources on the property.